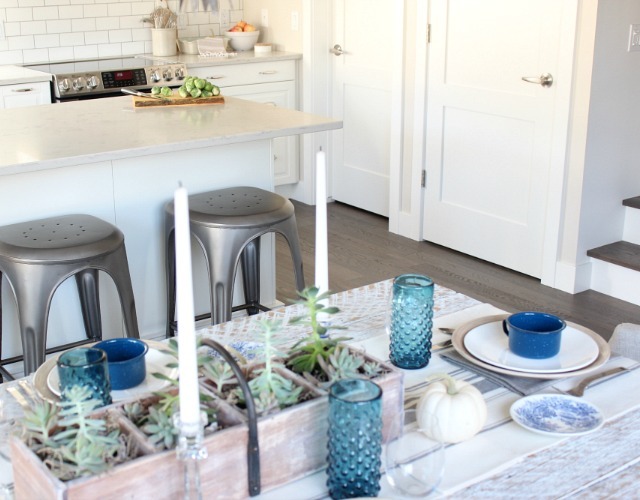 Get inspired by this Canadian Fall Home Tour, including our modern farmhouse kitchen and dining room decorated in eclectic vintage style with a touch of rustic. 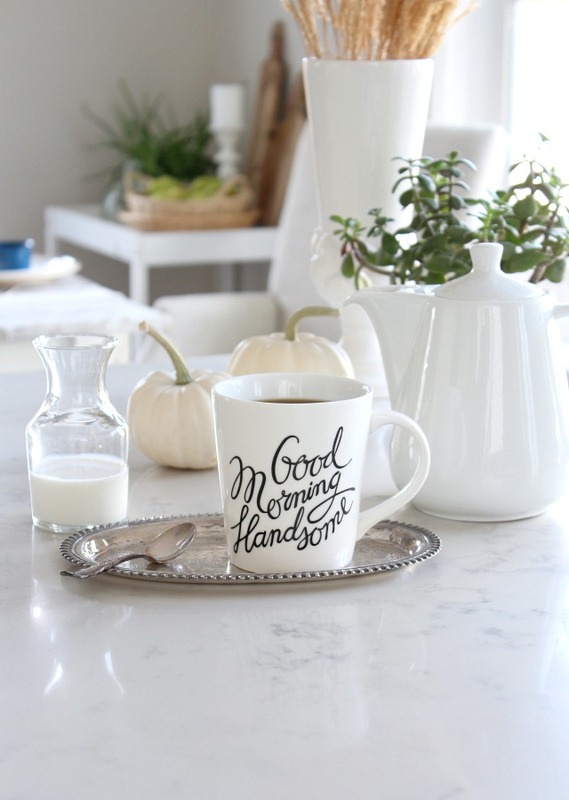 Hello friends, and welcome to Day 2 of the Canadian Bloggers Fall Home Tour. Firstly, I want to thank my friend Christina from The DIY Mommy for being our gracious hostess, along with 18 other talented home bloggers. Take a minute to grab a cup of coffee or tea and get comfy. If you’re like me, you’ll want to take in every last detail of these beautiful homes decorated for the fall season. Links to each one are located at the bottom of this post, so please take a look as they unfold over the week. 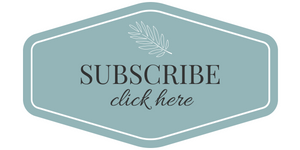 Whether you’re a first time visitor or one of my longtime readers, I’m so glad to have you here! We bought our builder grade house over a decade ago and have been working on adding character and personality, both inside and out, ever since. I’m a believer that creating a home that feels right to you and your family is a process and takes time. The important thing to remember is we’re all along a spectrum in achieving the home of our dreams. I’m by no means there, yet, but I do appreciate how far we’ve come. Please feel free to pin and share your favourite ideas. 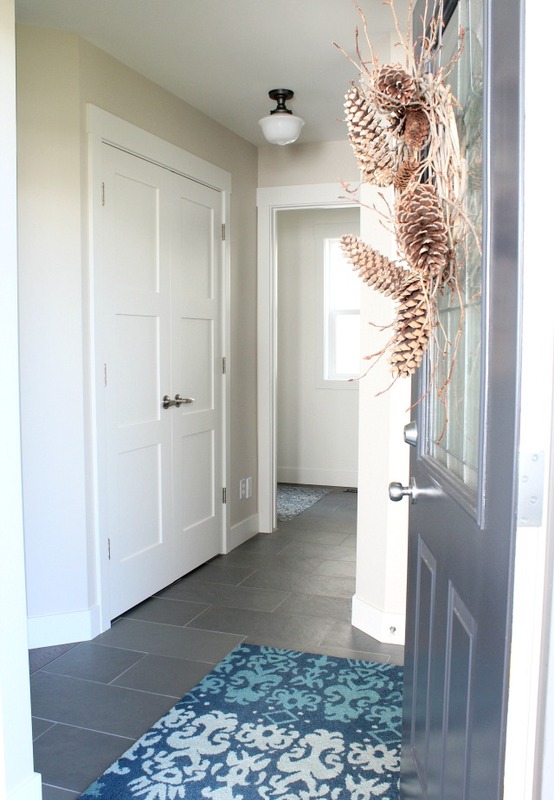 Our entryway is one of the spaces we updated most recently. It may be small (little we could do about that), but the grey slate tile, white shaker style closet doors and trim are much more functional and pretty than what was there before. To keep it looking fresh and uncluttered, I added simple fall decor like this twig and pinecone wreath I put together a couple seasons ago. Although our living room is the next space you see as you enter our house, I thought I’d save that tour for another day while we wait for some key decor pieces to arrive, like a new area rug and artwork. If you’re curious to see what it looks like naked, go here. At first, I planned on keeping the whole area neutral with shades of grey, white and taupe combined with textures of wood and linen. Greenery would make up the only sources of colour to be found. 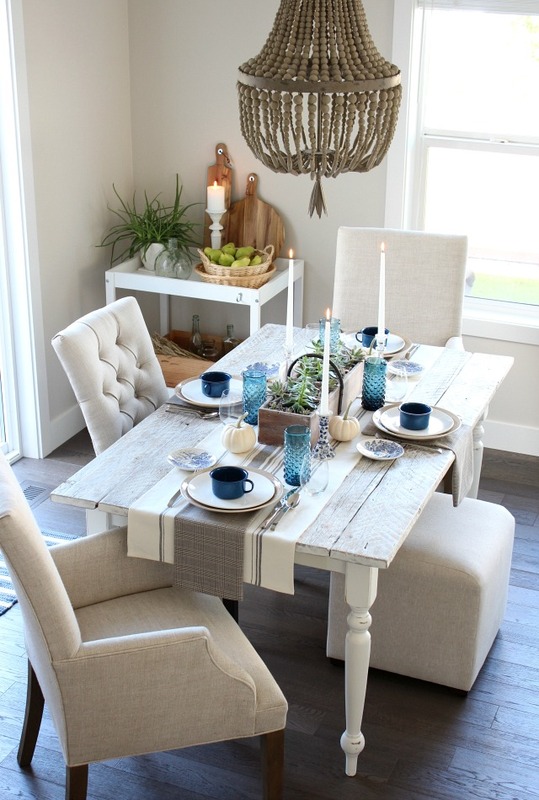 It made sense to go in that direction since our DIY rustic farmhouse table lends itself to that kind of style. Why all the blue then? Well, on one of my weekly stops at a local thrift shop, I spotted these indigo “depression era-esque” glasses with their fabulous bubbles and knew I had to have them. I splurged a whole $4 for the bunch. I embraced the neutral and moody blue fall tablescape idea, and out came my other thrift shop finds, including these enamelware soup mugs and vintage toile dinnerware pieces. Okay, so they’re typically not what you’d see put together in a fall table setting, but I liked the eclectic vintage vibe they gave off. Breaking rules and letting go of fuss is what casual dining is all about. 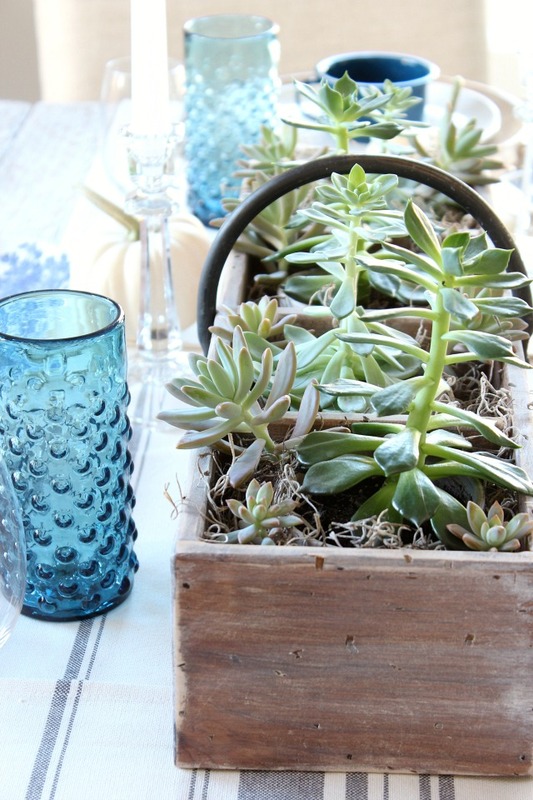 For the table centerpiece, I pulled out my trusty vintage toolbox and added moss and succulents I potted earlier in the spring. I like to shop our home first when decorating any space to save time and money. Speaking of which, I put 3 grain sack tea towels together to make up the table runner. 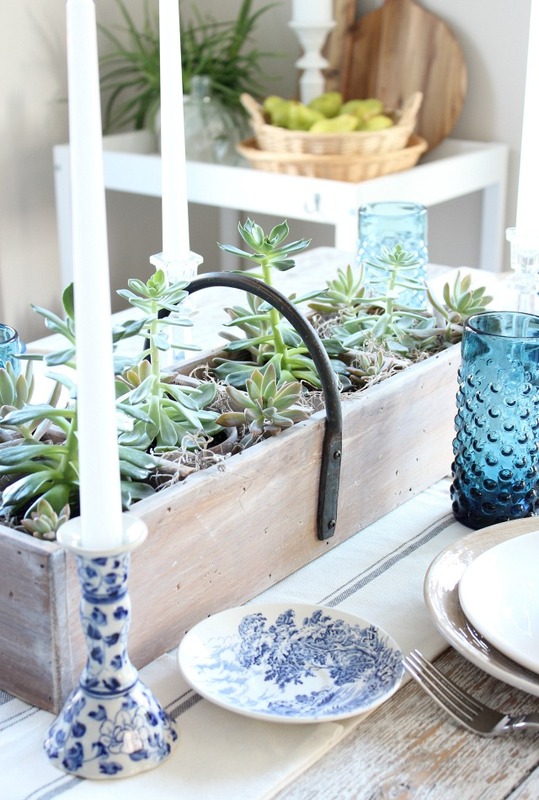 Always think about ways to repurpose items when decorating your home. 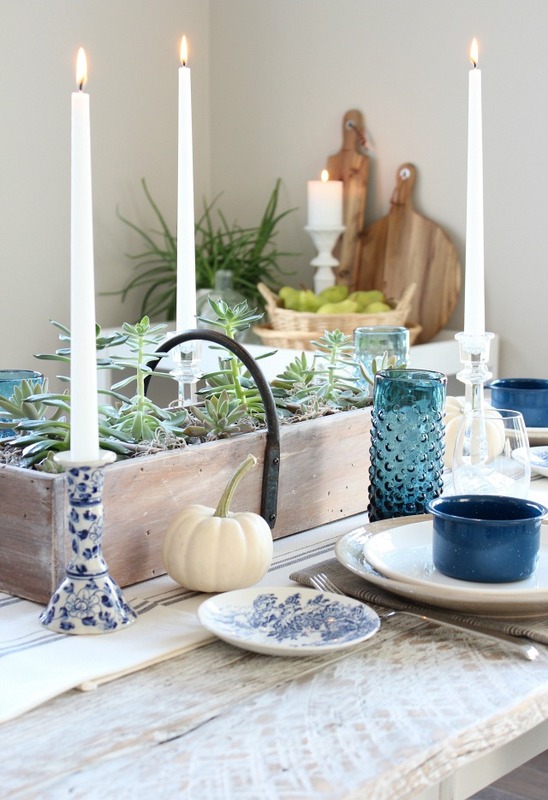 Evenings tend to come quickly once fall hits, so adding candles to the table is a must. I love the amber glow of real flames, which reminds me of a beautiful autumn sunset. For extra storage, I pulled out our DIY bar cart and styled it with some rustic wood serving boards, seasonal fruit, wheat from my parents’ farm, as well as other vintage decor items I’ve picked up on my travels. I even found the plaid fabric to make the napkins at a thrift shop and will be sharing those details in an upcoming post. They ooze fall, don’t they? One thing we did splurge on during our kitchen and dining renovation was the beaded chandelier. However, most of the options I had been looking at prior to finding this beauty were 3 times the price. Sometimes all it takes is a little patience and resourcefulness (and good luck) to get what you want for less. My advice is to always shop around and decorate using a high/low formula. From our dining area, you can see the hardwood staircase leading to the second floor. We’re enjoying the look of the white-painted risers and hardwood treads that match the rest of the flooring on the first level. The makeover did wonders to open up the space and, again, I will be sharing a closer look in the coming weeks. This transformation was by far the biggest home improvement project we’ve tackled to date. If you’ve ever gone through a kitchen renovation you know how challenging it can be! Was it worth it? I can say yes now, but I’m not sure I’d live without a kitchen ever again. I felt unsettled for months. We’re definitely not a take-out kind of family. We LOVE home-cooked meals and spend a lot of time in this space. For me, decorating the kitchen for fall is all about embracing simplicity and allowing seasonal produce to be the feature. 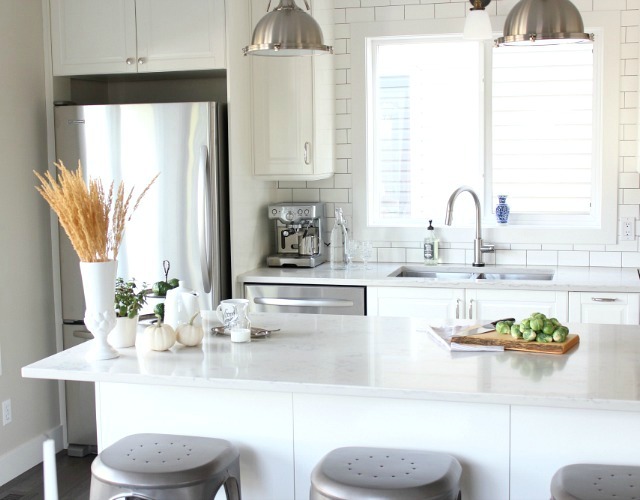 That’s the beauty of having a kitchen made up of shades of white, including our subway tile backsplash, IKEA Bodbyn cabinets and marble quartz countertop. My favourite improvement of the entire space is the large one-level island. We used to have a tiered island that was awkward and seemed to cut the room in half. Now it’s open and full of functional storage. With just the two of us at home for most of the year (our son is in post-secondary), we eat many of our meals here. It’s so convenient! We also have loads of counter space for prepping and serving and adding fall decor, like this vase filled with ornamental grasses clipped from the outdoors. Do you need to refill your coffee cup before we move on? I also love that I’m able to see what’s going on in the living room while I’m cooking. I’m nosy like that. You? Now that you’ve taken a little peek into our living room, it’s time to send you along to see what my blogger friends have been doing to get their spaces ready for fall. I hope you’ll be back to see future home projects like our new living room decor, staircase makeover, or my favourite season to decorate, Christmas! 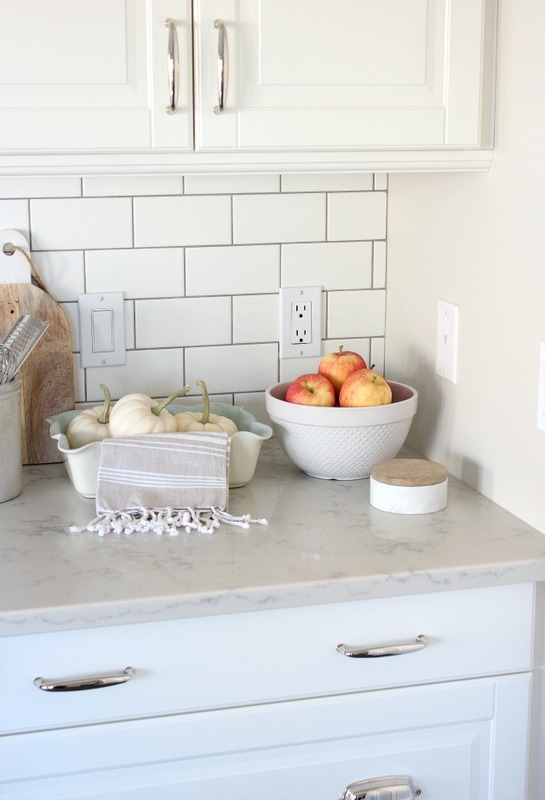 Pin this Canadian Fall Home Tour for later! 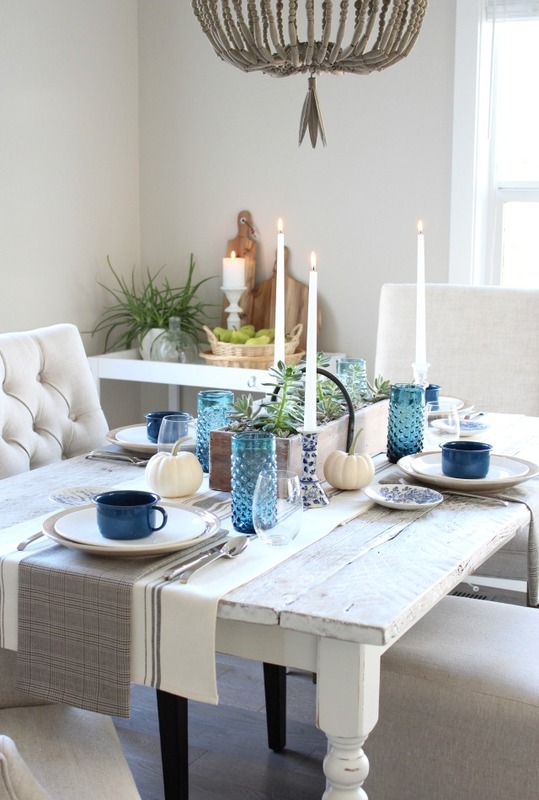 Each day, a new group of Canadian home bloggers will be sharing their decorating ideas. Be sure to visit each fall home tour by following the links on the days below. I know you’ll leave feeling inspired and ready to embrace the autumn season. Enjoy! Thanks for stopping by our fall home tour! Shauna this looks divine, such a clean and classic tablescape too. I have that Italian Countryside pattern in dinner plates! Thrifted too. Love what you did with the dining room/kitchen. Thanks, Ariel! I’m always on the lookout for that pattern at garage sales and thrift shops. It will likely take me a lifetime to find a whole set, but that’s okay. Thanks for stopping by! Very pretty! I love your kitchen!! Thank you so much, Anne. We’re enjoying the space so much more than the previous kitchen! We were in your neck of the woods a couple times this summer. I’d love to meet up the next time we’re there. Such a pretty town! I just had a great time scrolling through your home! Love the way you used the tea towels as a runner! We have the same island countertop! Don’t you just love it? 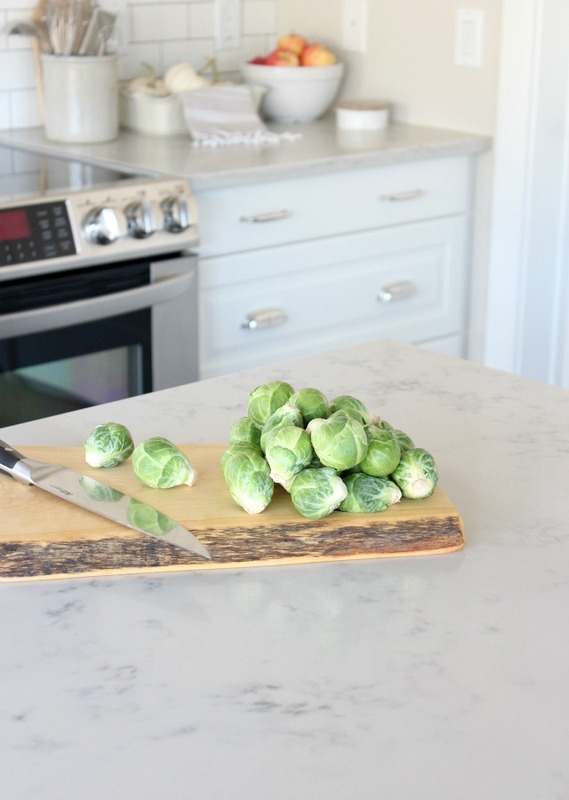 Yes, we LOVE that countertop! So forgiving and the colours seem to tie our entire main floor together. I’m glad you enjoyed the little tour! I LOVE this Shauna! I always wonder how to decorate my island without it looking cluttered and you did it perfectly! 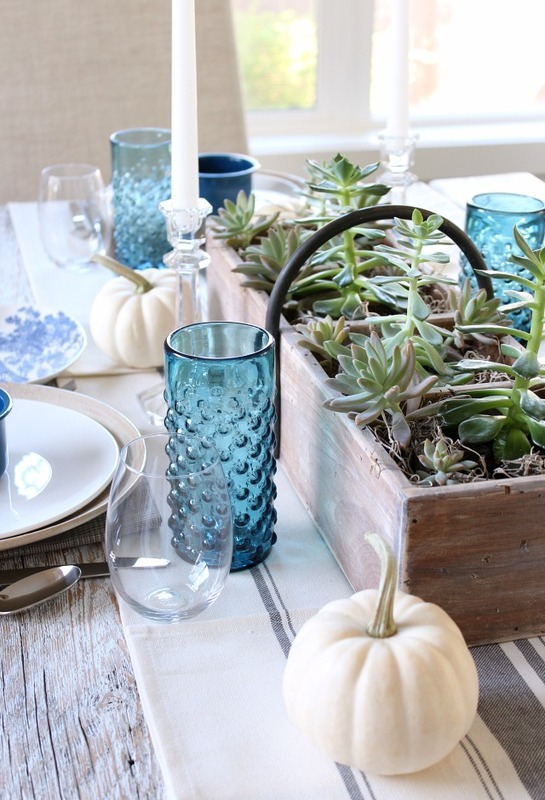 I’m also seeing more and more blues for fall – LOVE how you used it in your tablescape! So honoured to be a part of this home tour with you! Thanks for the sweet comments, Lindi! Yes, I’m seeing more and more homes being decorated in non-traditional seasonal colours. I’ve already started thinking about my Christmas decor and I’ll probably be pushing the envelope there as well. Hard to say at this point though. your table looks so beautiful, shauna! loving those blues! Thanks, Cassie! I’m digging indigo and moody blues right now. 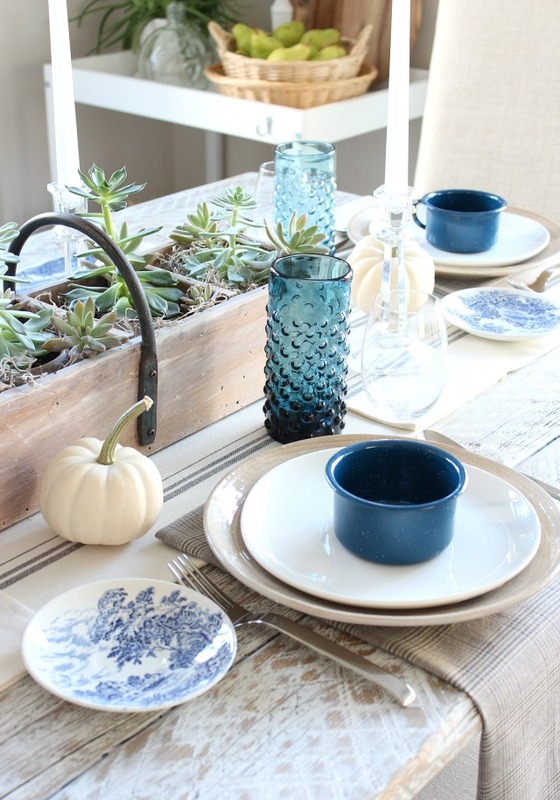 the blue dishes and super thrift store score in those glasses totally make the table, well done:) just so lovely! Wow! Your kitchen is beautiful! 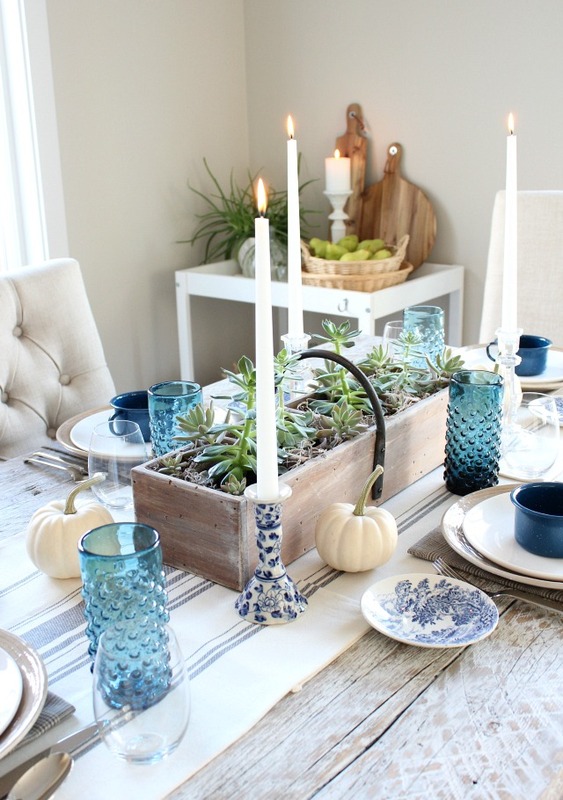 Love the tablescape and all of the blues. So pretty! Thanks, Jenn! We’re enjoying the whole space so, so very much! I’ve missed you lady!!! Are you okay if I gush a little? ;) All true words… your design style, your writing style and your photos are all spectacular, I felt like I was visiting with a long lost friend! Wow, I adore your kitchen and of course I so appreciate you shopping your home… I may have a room full of treasures, but I’m sure you know that about me. :) thank you for the gorgeous tour off to pin & share! Laurie, You are such a sweetheart! We definitely share a love of weathered pieces with stories to tell. Why do we have to live so far apart? We’d be the best vintage/antique shopping partners, for sure. And instead of swapping clothes, it would be home decor ha ha. Someday, my friend! Simply stunning, Shauna. Those glasses were such a score; I LOVE them! Your table is beautiful too. Such a fresh take on Fall! Thank you so much, Christina! I walked into the store and spotted them almost immediately. It was a “start the car” moment for sure! Love your space! Especially love those blue glasses! They seem to be the star of the show. Thanks for stopping by. P.S. I enjoyed your fall tour. Stunning! Just beautiful Shauna. I’m with everyone else i’m loving those glasses! The whole tour was gorgeous! I guess it’s good none of you live in my town or I may have missed out on those glasses. I guess it was meant to be. Thanks for your kind comments and for sharing your beautiful home with us too! Shauna I’m so jealous of those thrifted glasses! They are amazing! How are you finding the thrift shops up there? I like visiting different towns because they all seem to have varying stuff. You never quite know what you’ll come across, right? Anyway, thanks for stopping by! 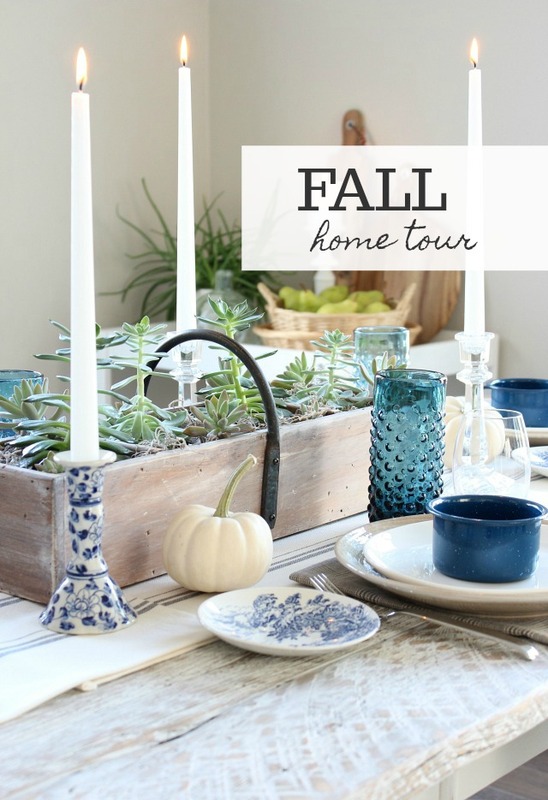 Just love this little fall home tour! you have great style and taste. And your kitchen/dining area is very pretty! Awe, thanks Kristen. We’re definitely enjoying it. I am in love with your dishes! Especially those fantastic cups. The shade of blue is perfection. Love it all! Thanks, Jen. Definitely an eclectic mix, but that’s my style. Your fall home is beautiful Shauna! 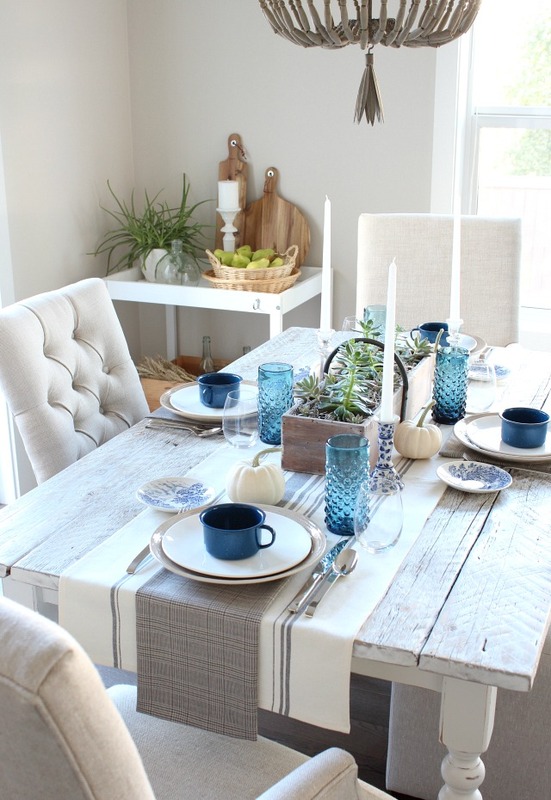 I love all the shades of blue for fall, it’s a fresh and welcome take on this season! So lovely. Blue just seemed to be where it was at with me, so I didn’t fight it. Of course, the traditional colours are pretty, too, like those beautiful green glasses of yours. Thanks for popping by! 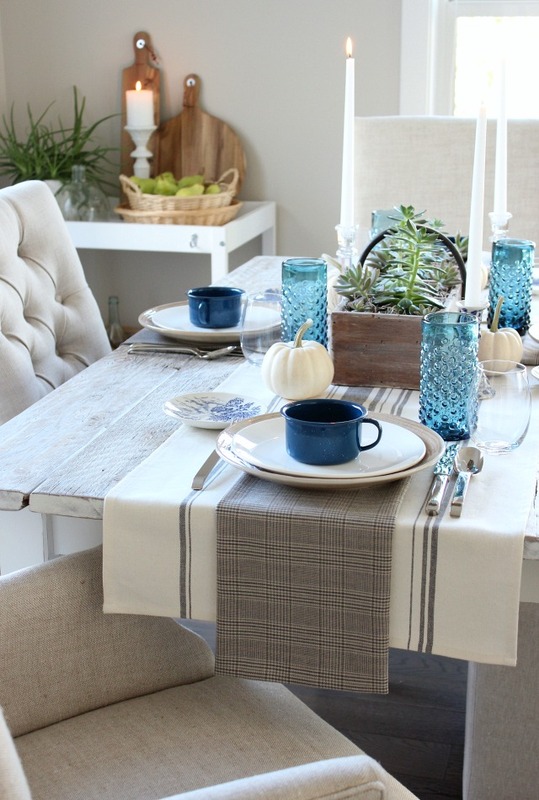 I LOVE your grainsack table runner idea, Shauna! That is genius! It’s called, “I’m too lazy to sew a table runner or run around and find one, so why don’t I use tea towels” ha ha! You know how it goes! Awesome job! LOVE LOVE LOVE your style! I didn’t know you were a fellow Canadian blogger eh?Pretty Cool. 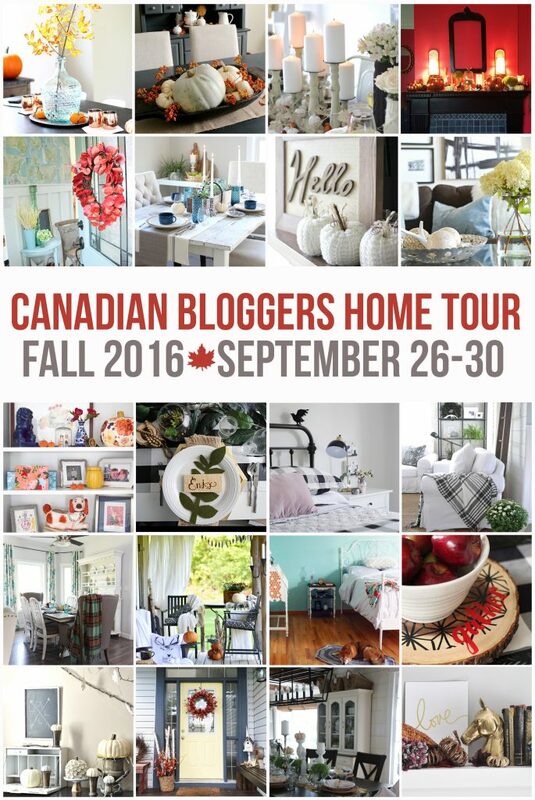 Love the Canadian Fall blog hop – great idea! Thank you, Debi! It’s funny when you follow blogs for awhile and find out later on they’re Canadian too. We’re getting to be quite the pack! Shauna!! I love it!! 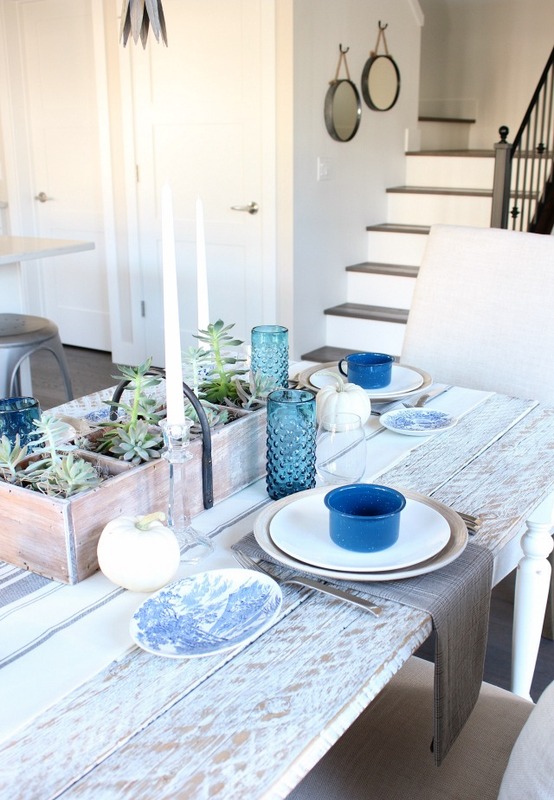 Such a gorgeous blue table setting – you know thats right up my alley! And your kitchen?!?! Love that island – amazing job!! Yes, we both have a love of the watery colours, for sure. The best part about our kitchen is having it done ha ha (as you know what I’m talking about after your fiasco)! Thanks, Sheila! It always seems like time gets away from us, doesn’t it? Thanks for popping by for a visit! Beautiful kitchen! 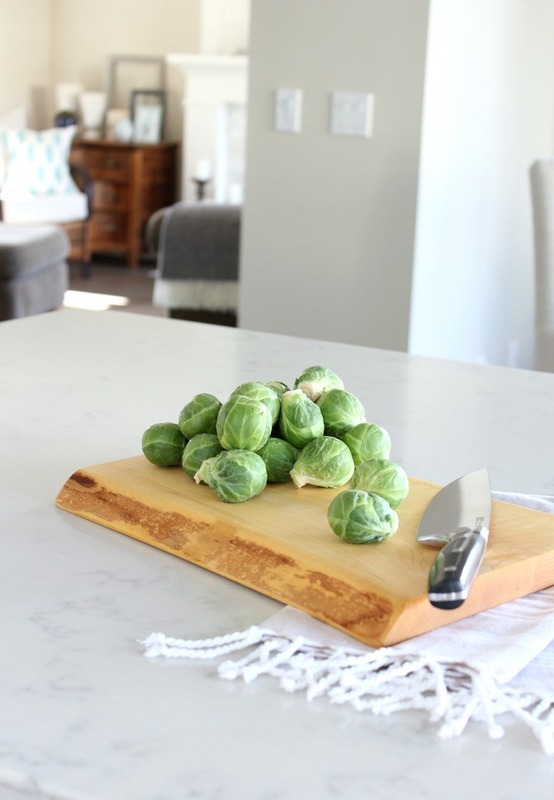 What is the brand and name of your quartz countertops? 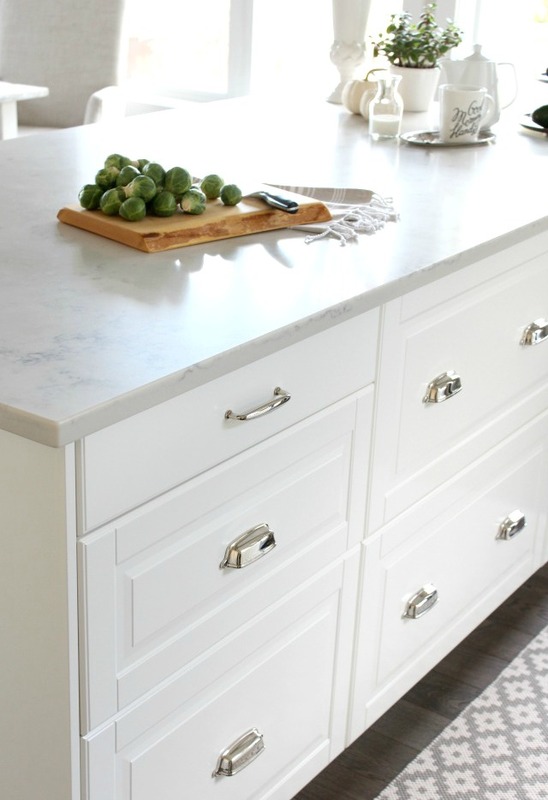 We bought IKEA bodbyn white cabinets and I’ve been struggling to find a marble quartz countertop I like that doesn’t make the off-white cabinets look cream colored (instead of white). 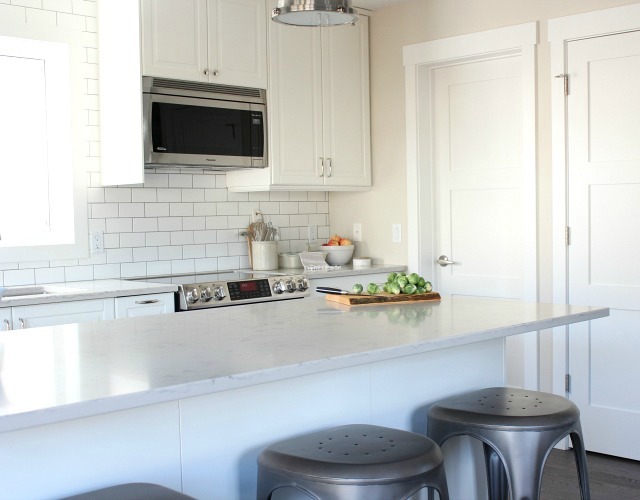 I love the countertop you chose!